Good dentistry creates and enhances beauty. Dr. Gerald Marlin combines over 40 years of experience, an eye for detail in the dental arts and ongoing training to deliver advanced care and world-class cosmetic dentistry with over 3,000 dental implants surgically placed and restored. 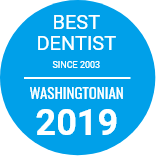 As the most experienced prosthodontic (specialist) team in the Washington metropolitan area, we are known as problem solvers. Call 202-244-2101 today to schedule your one-on-one consultation with Dr. Marlin. Patients visit us from across the country for treatment in complex cases. We perform a wide spectrum of procedures, all of them customized to your needs and goals. Dr. Marlin and each member of our team maintains an unwavering commitment to excellence. At Prosthetic Dentistry of Washington D.C., you are an active part of designing your treatment. Dr. Marlin will tell you about and show you pictures of our success stories, and explore how our advanced technology and innovative techniques can meet your goals. Learn about our in-house dental lab, the implant restoration system invented by Dr. Marlin and more.